I love it! The block I made is on the top left (strawberries). 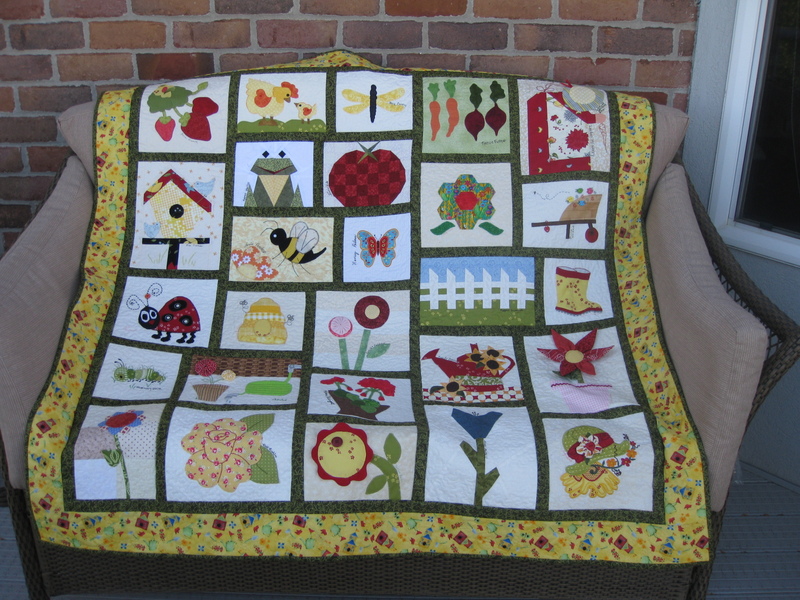 All the other blocks were made by friends from our quilt guild. Their work is amazing, and 27 of us ended up with a beautiful quilt... Blocks were done using different techniques: machine embroidery, hand applique, machine applique, paper piecing. Buttons, yo-yos, ric-rac embellished some of the blocks. Their creativity was amazing! Worth staying up for, don't you think? If you belong to a quilt guild, this is a great idea for the upcoming year. All ladies who sign up pick a block of their choosing, then make as many as there are ladies participating. There are no guidelines as to which technique to use, and the theme is Garden. Make a list of what each person decides to make so as to not have repetition (if you wish). At the end of the year, line up all the blocks on a long table, and each person takes one of each pile. 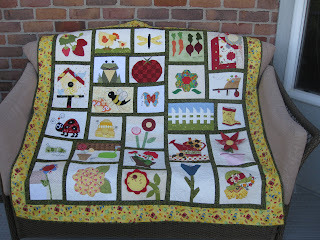 Then, race to have the quilt finished (I am a laggard, as it took me 9 months to get to it!!!). Gotta find the right spot to hang this quilt asap! This is so beautiful and such a great idea. What a beautiful quilt! I think it was worth getting up to finish :) What a treasure! I just gasped when that quilt popped up. So beautiful. I can't believe that's a group quilt . . . it is so cohesive. The colors look great and the blocks all fit together so well. Gorgeous!!! What a fun idea for a swap.